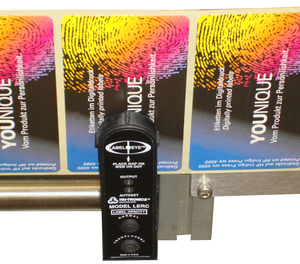 Model LF-80 is a Pressure Sensitive Panel Labeler for Round, Flat Sided and Oval Bottles. Labeling Speeds of up to 80meters/ 3,00inches per minute. The labeling applicator adjusts on 5 axes. European design. User friendly controls and a large color touch screen make changeovers easy and quick. Labeling speed: Up to 80 meters per minute/3,000 in. per minute with independently driven reel holder. Dual label press wheels for front and back straight sided bottles. 9’ 8” long synchronized variable speed conveyor with Stainless Steel infeed and discharge conveyor sections (Longer lengths and custom layouts available). Menu driven microprocessor control with over 250 alpha-numeric recipe capacity. Front and back label applicators for panel bottles. Extra SS conveyor length (Beyond the standard 9’ 8”) per foot.